Kym Borden said she'd never heard of an issue with Hyundais catching on fire until hers did. The National Highway Transportation Safety Administration – the federal government’s top highway safety agency – last week opened two new investigations into fires involving Hyundai and Kia vehicles after receiving complaints of more than 3,000 fires and more than 100 injuries. 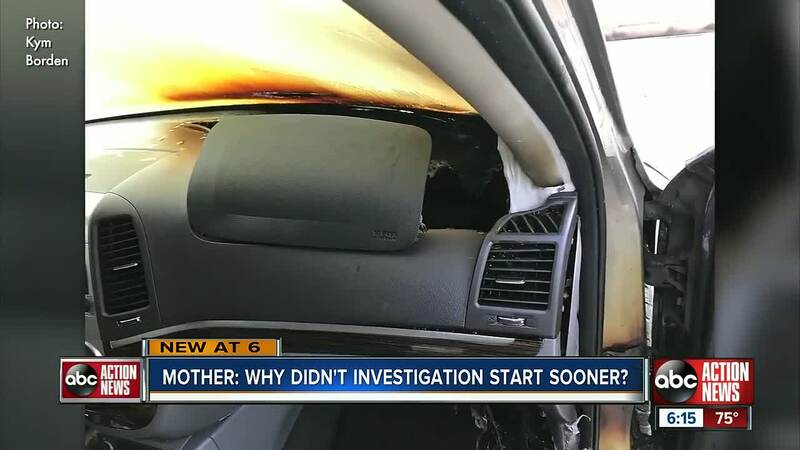 The announcement of a federal investigation comes nine months after the I-Team began exposing these car fires and a watchdog group petitioned for a federal probe. Now Borden wants to know why federal regulators had been dragging their feet in opening the investigations. Borden said she was woken out of a dead sleep on March 27 when a fire in her 2011 Hyundai Santa Fee triggered the car alarm. “As I am running out, the neighbor across the street was pounding on the door that my car is on fire,” said Borden. Borden said her SUV was parked just outside the garage. She told I-Team Investigator Jackie Callaway she fought the flames with a fire extinguisher before her garage caught fire. “I had emptied my fire extinguisher, so I ran over to the side and grabbed my hose,” said Borden. An I-Team review of federal documents reveals more than 3,000 fires in the 2011-2014 Hyundai Santa Fe vehicles and four other models. The 2011-2014 Hyundai Sonata, the 2011-2014 Kia Optima, the 2011-2014 Kia Sorento and the 2010-2015 Kia Soul. The I-Team reached out to NHTSA and asked why it took so long for the agency to open its investigation. A spokesman didn’t directly answer the question, but pointed to an earlier probe the agency opened into whether certain models of Kia and Hyundai vehicles should be recalled. Borden said there was only minor fire damage to her home and told the I-Team she believes the only reason she and her 19-year-old son are still alive is because she didn’t park her SUV in the garage that night.